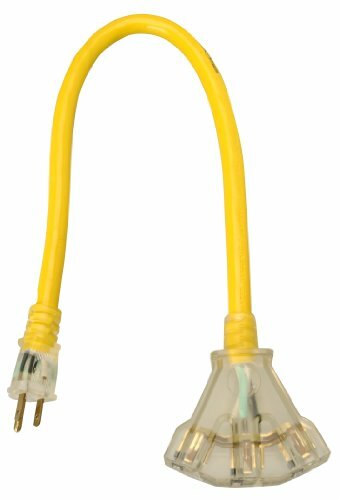 Yellow Jacket 2882 12/3 Heavy-Duty 15-Amp SJTW Contractor Extension Cord with Lighted Power Block, 2-Feet. Extra heavy duty 600-Volt insulated wire. Molded power block stands up to rough use on jobsites. Eliminates the cost and clutter or running multiple cords. Power Lite power indicator lamp glows through the extra heavy, clear molded plug when the cord has power. Meets OSHA specifications, UL Listed. 12 Gauge. The Yellow Jacket (R) brand is a registered trademark of Coleman Cable Inc.